Made from consumer paper products, cellulose insulation typically contains about 85 percent recycled content. Using this green building material can effectively lower the carbon footprint of your home or business property. Essentially, this is because cellulose insulation is plant cell matter that is still storing the carbon sequestered when it was alive. Responsible management of the US forestry industry has led to a sustainable supply of planted trees, which are a highly renewable resource for both building and paper products. Combining this with the huge success enjoyed by the US recycling industry, makes cellulose insulation one of the top green building materials on the market today. 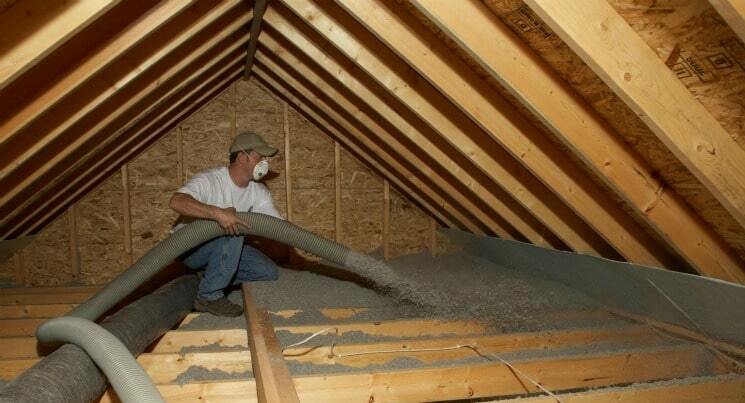 Adding extra insulation up in an attic is one of the easiest and most cost-effective ways to improve a home’s energy efficiency. Insulating power of up to R-49 can be achieved in an attic with additional cellulose insulation blown in. This is the best place to start when looking for an inexpensive but significant energy savings, since a building loses most of its energy through the roof. Cellulose is treated with a natural, non-toxic borate product that is a Class I fire-retardant. This makes it highly undesirable to bugs and rodents, as well as resistant to mold and fire. 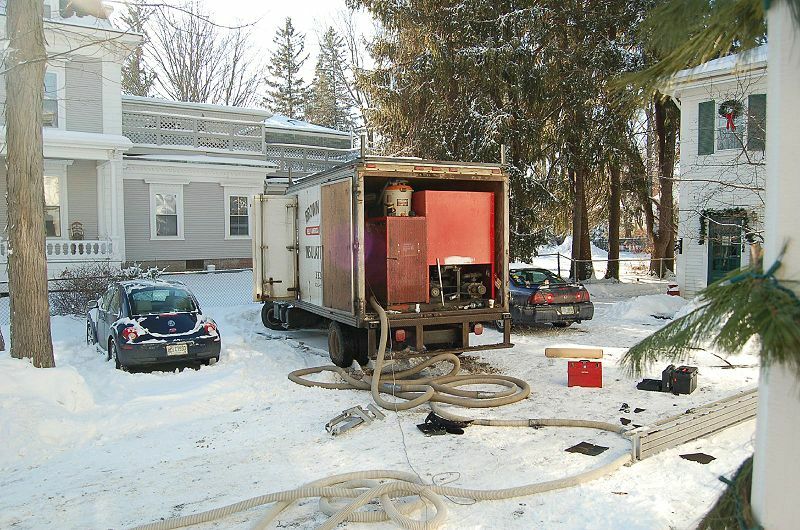 And, although the job is dusty, installing this insulation is not difficult, even for the average homeowner. There is virtually no waste or excess material left over from an installation job, either, because it is fully recoverable. The unused and swept up material is simply returned to the bag. Thomas Jefferson was the third US president. 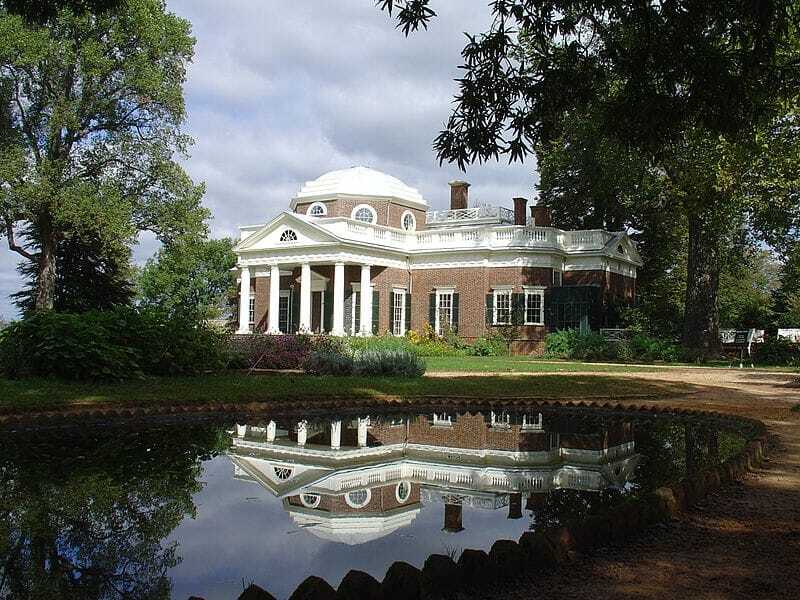 In 1769, at age 26, Jefferson inherited 5,000 acres near Charlottesville, Virginia, and began building his famous Monticello Plantation on this beautiful estate. Cellulose has excellent insulating properties, often with a higher R-value than fiberglass batts. It is especially good at filling up walls tightly, increasing energy efficiency by reducing air pockets. It’s a perfect choice for many areas, such as pipes and wiring, that are difficult to insulate with other products. A study performed by the University of Colorado School of Architecture and Planning compared two seemingly identical structures. One was insulated with cellulose and the other with fiberglass. 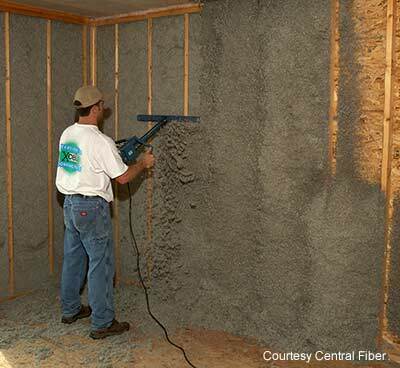 The cellulose insulation performed much better, losing 26.4 percent less heat energy compared to the fiberglass. The cellulose insulation also made the structure 30 percent more airtight. While any type of insulation can improve a building’s energy efficiency, using cellulose insulation can contribute to obtaining LEED certification credits from the US Green Building Council. The manufacturing process of any product requires energy. This is what is meant by “embodied energy.” More embodied energy in a product means that product is likely contributing significantly to global warming. Cellulose insulation is available in a wide variety of formats, including loose-fill, batt, and blanket forms. Loose-fill can be applied as a moisture-added spray into open wall framing, dry dense-packed into enclosed framing cavities, and dry blown into open attics. Although the moisture-added method needs training and special equipment, loose-fill blown-in attic applications are possible to do it yourself with a little help and the correct equipment. • Dry Blown Loose-Fill Cellulose — This method requires a two-person team, with one person feeding dry, loose-fill insulation into a blowing machine. The machine blows the cellulose through a long hose controlled at the point of application by the second person. The packaging will indicate the depth of insulation that should uniformly cover the area to achieve the desired R-Value. The blower is commonly available for rent at home improvement stores, tool rental centers, and some specialty lumber yards. It may even be rented for free when purchasing the insulation at the same location. Don’t forget dust masks and goggles, as blown-in cellulose can be dusty. 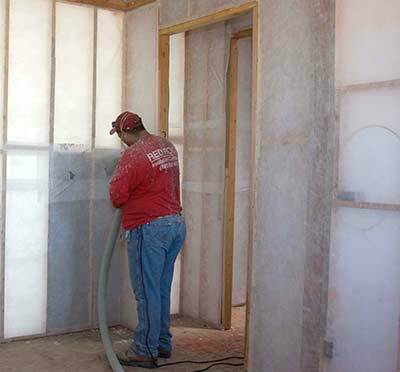 • Sprayed (Moisture-Added) Cellulose — This method is commonly used in new construction before drywall is installed. Wall and ceiling cavities are still open, offering a convenient opportunity to spray in the cellulose. A small amount of water is added as dry cellulose is blown from the applicator hose. This activates natural starch adhesive properties in the cellulose, allowing it to adhere tightly to surfaces within the wall cavities. The spaces between the studs and against the exterior sheathing are filled in completely, leaving no gaps or voids through which air can pass. Excess material is scraped off flush with the face of the studs and recycled back into the blowing machine. 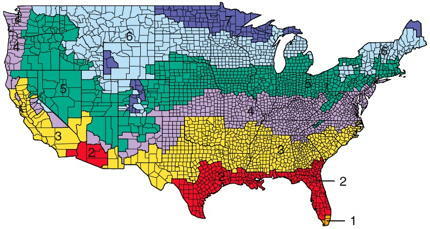 The moisture typically dries within 1-2 days and then can be drywalled over. 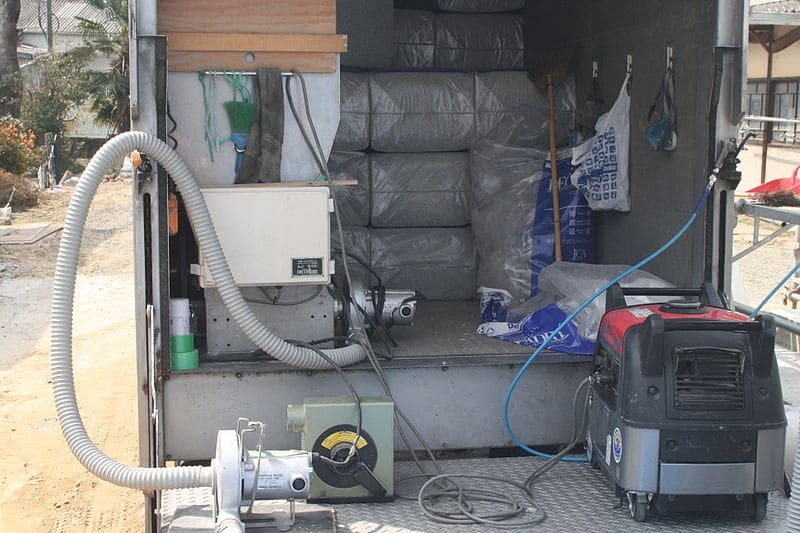 Ready for a Cellulose Insulation Workshop?